It may be a bit cold right now, but spring and summer will find their way back before we know it and if you are anything like us you may use your grill all year round anyway. I have a picture of my husband out of the deck in boots, pajamas, and a coat grilling our Sunday dinner in the snow once. He wanted that steak and the snow wasn't about to stop him! You may not be quite that devoted (or ridiculous, as the case may be) but even in the colder climates there are plenty of months each year to enjoy the grill. Last summer we gave grilled pizza a try and it was a hit. It is fun, the kids thought it was pretty clever, and we all agreed that it was delicious! 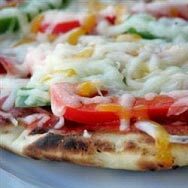 I wanted to share some recipes for grilling pizza with you. Whether you go light the grill in your snow boots or wait for the summer heat, these recipes are sure to leave you happy. Prepare a hot charcoal fire, setting the grill rack 3 to 4 inches above the coals. On a large, oiled, inverted baking sheet, spread and flatten the pizza dough with your hands into a 10 to 12-inch free-form circle, 1/8-inch thick. Do not make a lip. You may end up with a rectangle rather than a circle; the shape is unimportant, but do take care to maintain an even thickness. When the fire is hot (when you can hold your hand over the coals for 3 to 4 seconds at a distance of 5 inches), use your fingertips to lift the dough gently by the 2 corners closest to you, and drape in onto the grill. Catch the loose edge on the grill first and slide the remaining dough into place over the fire. Within a minute the dough will puff slightly, the underside will stiffen, and grill marks will appear. Using tongs, immediately flip the crust over, onto the coolest part of the grill. Quickly brush the grilled surface with olive oil. 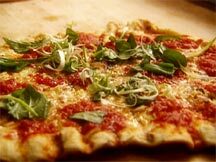 Scatter the garlic and cheeses over the dough, and spoon dollops of tomato over the cheese. Do not cover the entire surface of the pizza with tomatoes. 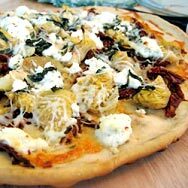 Finally, drizzle the pizza with 1 to 2 tablespoons of olive oil. Slide the pizza back toward the hot coals, but not directly over them. Using tongs, rotate the pizza frequently so that different sections receive high heat; check the underside often to see that it is not burning. The pizza is done when the top is bubbly and the cheese melted, about 6 to 8 minutes. Serve at once, topped with the basil leaves and additional olive oil, if desired. Sprinkle the yeast over 1/2 cup warm (105 to 110 degrees F) water and allow it to dissolve and activate, about 5 minutes. Combine the flour and salt and mound it onto a cool work surface creating a high walled well in the center. Combine the yeast mixture with 1 1/2 cups of cool water and pour into the well. Slowly begin to mix the water and flour, a little at a time, moving your fingers in short, counter clockwise circles around the border of the water. When the dough is firm enough to hold it's shape, scrape the remaining flour over it and knead until the mass is smooth and shiny, approximately 7 minutes. Transfer the dough to a bowl that has been brushed with olive oil. Brush the top of the dough with olive oil to prevent a skin from forming, cover the bowl with plastic wrap, and let rise in a warm place away from drafts until doubled in bulk, about 2 hours. Punch down the dough and knead once more. Let the dough rise again for about 40 minutes, punch down again and form dough into 4 balls.